What kind of light rail should we get? 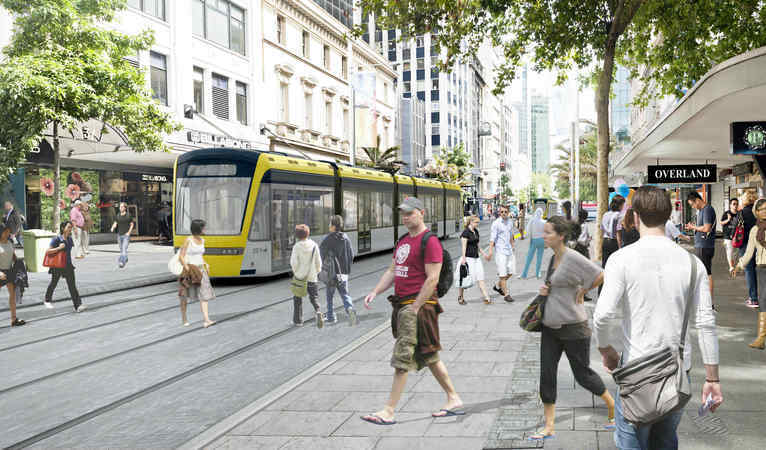 Ever since Auckland Transport first started talking about light rail, initially just on the isthmus, it’s been shown as modern, low-floor vehicles, like you might find gliding through a European city. An attractive and exciting proposition for sure, one made even better with the new government have committed to it. Since those initial plans, what light rail has been tasked to do has changed considerably. No longer are we just building a line on the isthmus but we’re going to be using light rail to play a key role in our regional rapid transit network. What’s proposed is capable of fulfilling the tasks needed of it. However, over the weekend I was also thinking about how light rail can be a quite broad term covering many different types of vehicle. So, with this post I thought I’d look at a couple of them and ask if we should be considering them as options too. The key difference between these are the floor height. This is what appears to be proposed and is increasingly common on modern systems. It’s what’s used on the Gold Coast, is being built in Sydney right now. Typically they have a floor just 300-350mm off the ground and so require a platform only slightly higher than a normal kerb to provide level boarding making it easy and unobtrusive to provide. Typically they tend to have a top speed of 70-80km/h which is usually more than enough for most settings. Speed has often been cited in debates in the past about using heavy rail but even our trains, which have a top speed of 110km/h, don’t get above 80km/h all that often. One downside is they usually have wheels attached to the chassis rather than on bogies like a train does and can make them a little noisier on some tight corners. Some systems overseas retain level boarding off a low platform but have a raised section at the ends of the vehicles over the wheels. This is much like we have with the middle ‘trailer’ car on our trains. This is typically used on some of the older American light rail systems (but some newer ones too). The advantage of looking at an option like this is that it can allow for the vehicles to have bogies like a train, allowing it to handle corners easier and therefore faster. 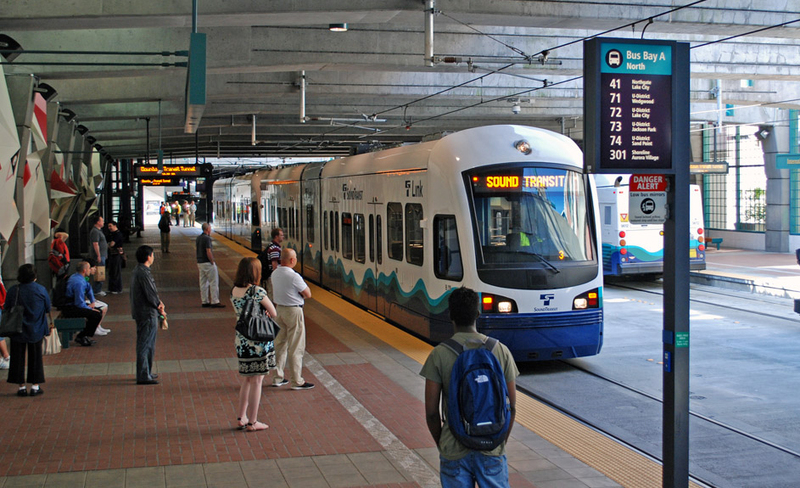 One of the more recent examples is the Seattle Light Rail which can reach speeds of over 100km/h. That extra bit of speed might be useful on some of the longer stretches out to the Airport, Northwest and the North Shore. 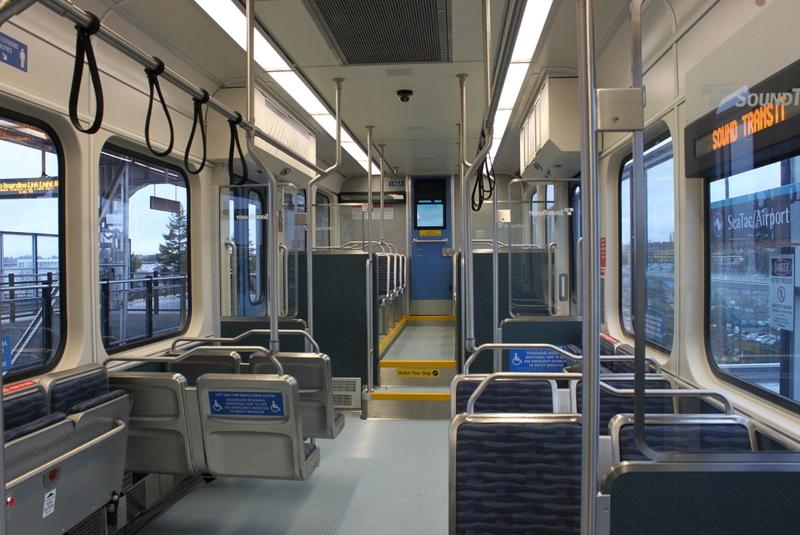 There are some systems that use high-floor light rail to keep level boarding to get the advantages of using bogies but to avoid having steps inside the carriage. The downside to this is that you can’t just have a high kerb but instead need raised platforms for passengers to be able to get on and off. Perhaps a flip side to this is it could make stations more prominent and more of a ‘rail’ feel. Particularly useful for those thinking we’re just talking spruced up trams here. While there are certainly some benefits of this approach, I’d be highly sceptical of the idea of putting raised platforms at a number of locations down Queen St. I assume that most of the focus on light rail has been on getting the project approved rather than the specifics of the vehicle, and fair enough too. As the project moves closer to becoming a reality it would be a good idea to ensure we’re thinking about just what type of vehicle and experience we want to achieve, not just for the first section but for future, much expanded network. I suspect this will most likely be the 100% low-floor option though. – Doesn’t make the stops too imposing, I think it’s particularly important around the CBD, but also along the existing transit corridors like Dominion Rd or Sandringham Rd. – Gives us the extra few km/h of speed (but also a bit more comfortable ride). On stretches past Onehunga towards the airport, or past Pt Chev along NW that will come in handy. If we’re serious about extending it to places like Kumeu than speed will be important. Since all of that stop infrastructure will be build – I think it’s also worth figuring out if we should build those stops with buses in mind too. Some sections of those lines (like Lincoln Rd to Westgate) overlap with proposed BRT. Having a single stop for both systems would work great. Whether we can make this work from track/surface perspective is another question. Light rail tends to require a narrower corridor. Perhaps using something like the O-Bahn system could help here. Is there any difference in the gradient that each option could handle? And the change in gradient? The gradient a particular LRV can handle has a lot to do with what proportion of its wheels are powered, and what proportion are just trailers. I don’t know but that suggest the high floor versions might make it easier to have all the wheels powered/braked. The change in grade is influenced by the length of each solid section of the carriage, the longer the sections the easier it is for them to bottom out on a vertical crest or slump. Right! Standard off the shelf LRVs with 2/3 to 3/4 of bogies powered are good for a maximum gradient of around 8%, all powered bogies 10% to 12%. The high floor LRVs (e..g Stuttgart) can be fitted with rack and pinion systems if needed) and can do 12% to 15% if fully powered. How well are are these units going to handle turns and changes of grade? I wonder because I’m trying to figure out alignment options for the Onehunga/Mangere crossing. If it’s going over the existing or replaced (New) Old Mangere Bridge, then this might need to be a consideration. If it’s going over a third crossing it might be easier, but may not be the best alignment on the Mangere side. If it comes down the old rail corridor, then need to figure out how the LR links back further. Anything you could get an old heavy rail alignment down you can get an LRV along. The only constraint is that as curve radius reduces the speed is reduced. So to get a good travel time to the airport attention to these slow speed sections is actually more important than picking a vehicle with a higher top speed. I’ve been told that the Onehunga bridge was not built to have clipons and the Old Mangere bridge (supposedly) needs to be replaced within 5 years. So I’m not entirely sure how the units might use the existing bridges. Maybe southbound with the bus lane and one of the car lanes. With a stop maybe at end of Onehunga Mall or the lagoon. Alternatively if it used the New Old Mangere Bridge we get the benefit of a station close to Mangere Bridge town. Rimu Rd could also be used as a connection to put the tracks into the middle of the SH20 from there until the airport. Via the old HR route from Neilson St and down under the bridge – we have to figure out how the connection works at the Neilson St or Onehunga Mall end. Maybe the LR would come down Onehunga Mall and it would be closed to cars. If instead the LR comes over Glouster Park, then there is grade change with a turn. The Onehunga harbour crossing is a tricky spatial node. A sane version of the EWL is still in play – whatever that is – so I think it’s useful to clarify any issues that affect the technical options. The Motorway crossing was designed with enough capacity to have clip-on’s, however I do agree the new Mangere bridge bridge would be the most ideal in terms of location of stations. I would opt for the Bi-levels (like our current EMUs) to give both the universal access of the low floor and the speed on some of the more open stretches. Good test run would be Manukau to the Airport via Puhinui as the land is both blank (currently rural) and urban with some tight turns in there (Puhinui Station and the Lambie Drive areas heading to Manukau). Why all ground level, and not Vancouver SkyTrain train style where it’s sometime elevated, sometimes ground level and sometimes underground? Would elevated be more expensive and block views? Although it did seem to work well for Vancouver. Elevated light rail is a better option than Ameti for crossing the Tamaki River and getting through the Pakuranga Road/Te Rakau/ Reeves Rd intersection before carrying on at ground level on Te Rakau/Te Irarangi. It could be combined with a bike lane over the Tamaki River. Rotterdam appears to have a variety of rolling stock on separate lines with high floor versions used on metro rail type lines – probably more equivalent to North Shore / NW requirements). I read somewhere that these models have a top speed of 110kmh. Thanks Matt. Are there any stats on passenger accidents within bi-levels? All things being equal, it seems the bi-levels have the advantage here. Beautiful, and red ones do go faster. The two-level option looks by far the best – as on all modern buses – but I cannot get past the terrible traffic hold-ups that will occur at every stop. Just as happened with the old trams in a slower era. Elimination of all car parking on busy streets like Dominion Road will cause chaos for shoppers and delivery vehicles. I am a keen fan of public transport such as light rail, but cannot see it ever overcoming the inherent drawbacks on our narrow streets. How are these problems overcome in modern tram systems in Croydon and Manchester, etc.? 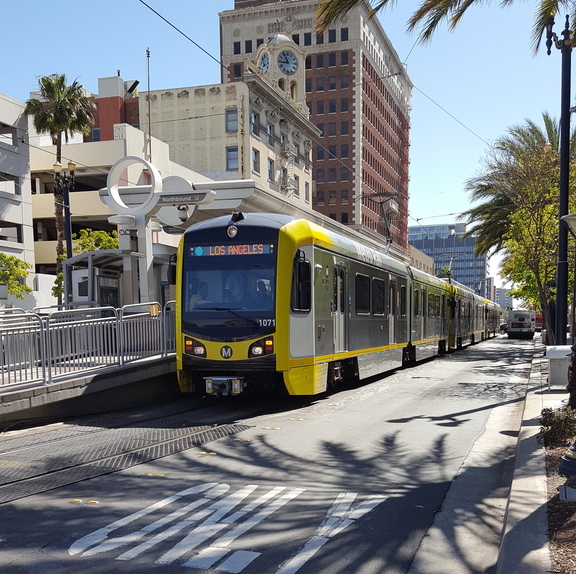 But there is no plan for traffic to share the Light Rail right of way; each will have their lanes, or traffic will be removed from the street entirely. And LR will have traffic light priority, so the only ‘hold ups’ will be at the stops. LR will be much less held up than any traffic is now. Wellington had quite an extensive tram network despite its notoriously narrow roads, so much so that they opted for a 4 ft track gauge. Since it has already been done, I’m sure someone can work out how to make a more modern system work. Those drawbacks exist for all modes – for example making it harder to fit in bikeways. It’s the question of what kind of city we want? One where cars get primacy, like we did the last 50 years, or one where public transport gets more, at least on key routes like Dominion Road? Of course sometimes that includes reducing convenience for cars. The idea that trams are bad for shops, however, even including some parking removal / re-location into the side streets… I can’t get over this. Shops thrive from people, not cars. Trams bring more people (and also more density = more people living close by). For an example of the notion that trams actually benefit retailers, one need only look to New Regent Street in Christchurch. The central city tram loop has been closed or services truncated several times for earthquake-related repairs in recent years, and there have been several local media reports detailing the concerns and frustrations of shop owners there about how this has negatively affected their businesses. It should be pointed out, though, that this is a pedestrianised street, and normally permits only delivery/service vehicles in addition to the trams. How is a tourist attraction relevant to a discussion of transport infrastructure? The fact that our streets are narrow suggests we need a better solution for deliveries and private vehicle storage. The idea that these happen on a key arterial with restricted space is absurd. Shoppers are generally people not vehicles. Light Rail will have its own dedicated lanes so only vehicles will hold up vehicles, the light rail will provide massive amount more capacity than the vehicular lanes and therefore more shoppers. Car parking will be on other streets and carparking lots/buildings for those who do drive, this will vastly improve access for shoppers with increased capacity and the ability to avoid ‘traffic hold-ups’. Traffic holds up traffic at every intersection. One of these moves more people through an intersection way faster than cars will. Noise for me is an issue and I think many others.. Please make sure these are quite around corners. And speed is an issue, so sounds like its now a choice between bi or hi..
Is there a system which allows the rail to carry heavy rail and light on the same tracks please someone? Ideally though the noise should be minimal as you’d want LRT to go to as many places as possible. tram trains certainly exist, but entangling the two networks offers no advantages and considerable disadvantages to Auckland. Separate networks offer isolation from faults and incidents. AKL’s current rail network is already more interlined than is deal. And anyway is full of both passenger and freight trains. The point of this project is to add a network. Patrick thanks for that. I am actually not thinking about intertwining two networks – Agree with you there. 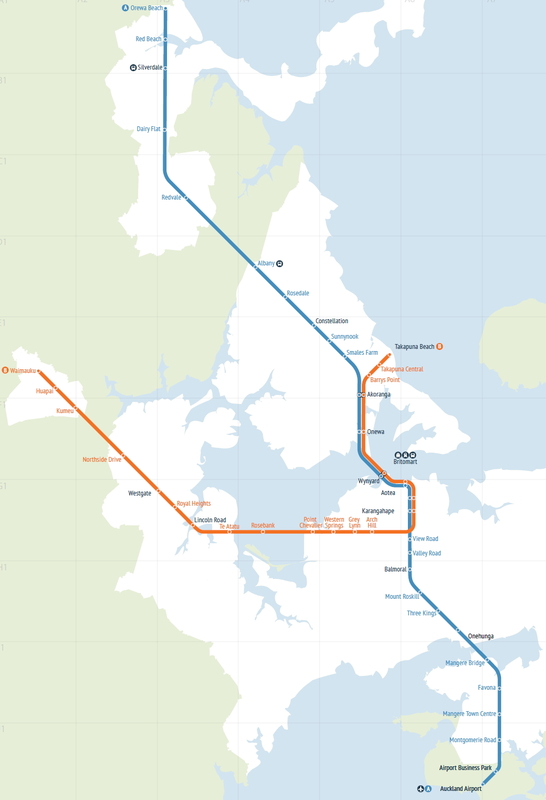 BUT how about abilitie for the tracks from Orewa to the CBD able to handle heavy rail at some point in the future even connecting to the Northern Auckland line at some point in future. i.e. then breaking off when it gets to CBD to join main heavy rail network. This may allow certain express services north or even freight. Please could you give your thoughts on this how it could work? If our HR network used the same gauge as LRT units, this might be feasible but, as it is, it doesn’t and speccing our LRT units to Cape Gauge would add a lot of cost to the LRT proposal as no one else, that I can see, uses LRT on Cape Gauge. The best option for that would be to leave 10 or 12m clear to the side of the line and design the bridges and structures to allow for two extra tracks to be added alongside. Operationally you’d have a nightmare trying to run heavy rail freight, expresses and light rail urban services on the same pair of tracks. Wellington had a Cape Gauge tram line in the late 19th century, but it would be quite unusual to encounter such a thing these days. New Zealand has also had dual-gauge HR track, but again, this would just add (unnecessary) maintenance costs and you’d still have complications from mixing two different types of traffic on the same lines. Having said that, Christchurch used to have a couple of examples where LRT lines directly crossed HRT lines on at-grade level crossings (in Riccarton and Sydenham). In the Riccarton case, there was a simple signalling system that alerted tram drivers of approaching trains so they could wait until the HR line was clear before proceeding across, and were more akin to a bus crossing a rail line at a level crossing. LRT is used on metre-gauge in many examples from Europe. Metre-gauge and Cape Gauge are very similar (with metre-gauge being slightly narrower than the 1067mm of Cape Gauge). Not saying narrow gauge tram networks don’t exist, but even many of the metre-gauge systems on that list are either very old (opened early 20th century) or have since been converted, typically to standard gauge. Standard gauge easily seems to be the most popular, particularly for new(er) systems, and to keep costs down (here in NZ) it would make sense to buy “off-the-shelf” where possible, which is likely to mean going standard gauge. There could be an advantage for duplicate use of depot facilities. Consider the depot at Wiri. If LR units could be parked and serviced there it might save on OPEX. Upgrading that site might also be possible with tracks for the LR units. Patrick whatever happens we are up for two systems. But you have to question the sense of running LRT all the way up to Orewa or Waimauku and trying to use it as a metro system. That can only mean long LRT units run as doubles. A better solution is to use LRT for the built up areas where there can be a lot of stops and where it can be integrated into existing streets where that is necessary rather than using light rail as an el cheapo train system. That way we could get both, an extensive commuter rail system and a distributor system. Rotterdam is changing a current HR line to LRT. Luckily, they run LRT and HR on same gauge so, it will allow freight to use the line at night. In the cases of Orewa and Waimauku, all one would have to do to turn the ‘el cheapo’ train system to a driverless metro in future would be to tunnel the short section under the CBD. This is an easy way to stage development to stage cost and allow scale to increase capacity. I would prefer to say small and manageable disadvantages. Two are 1) Need to make connections . Manage by placing stops convenient close. 2 ) Concerns have to pay more. Manage by having good pricing scheme and inform public. No every rail system that is introduced has to have a different current/voltage and preferably a different track gauge from anything nearby. I am not exactly sure why that is but there is always some older dude with an English accent who will be adamant that everyone else got it wrong. There is simply no advantage in slavishly following the happenstance of yore of our old system on a new network. They will never interoperate so why would you not make them as good and as cost effective as possible by using internationally standard dimensions and designs…? Yes quite, never improve anything and never pick the right tool for the job. If we followed your advice mfwic we’d all still be watching black and while TV broadcast over VHF antennae. I’m more than happy with the fact that my fibre broadband TV is incompatible with my neighbours satellite dish, which is incompatible with the other neighbours Freeview UHF. Now with a bad attitude like that how are we ever going to see freight trains running down the centre of Dominion Road? It could be the making of the place. Now that is just awesome! Would it make it around the bend at the bottom of Queen Street? Just think of the possibilities. We could design a small freight car that could carry one of those little containers that fit in the hold of an aircraft and run really long trains out to the airport. The Manchester Metro utilises the old HR tracks north to Bury and south to Altrincham with no difficulty. These two parts of the old rail network have been linked with new tracks running along the streets in the CBD. The Metro does indeed operate at two speeds; fast along the old railways and slower in the city streets. They even have two different horn sounds for the two operating environments. Loud two-tone like the original trains and a softer, quieter horn for use among pedestrians in the city. Ok well before we do this : Can we have one more critical look at if HR is not part of the solution. Not to try to stop what is an amazing system just.. can we creatively look at how parts can be upgraded to HR if needed for high speed rail later? i.e. Walkworth? But not just “one more critical look”. We need continual re-assessment and flexible-thinking as to where we are going with all this. And this requires a level of honesty as to the pros and cons of the various options, including what continuing to develop the HR system can and can’t offer. +1, especially on the shore route this is worth looking at given the longer distances that may eventually be covered. The assumptions in the Jacobs report will be reviewed as part of pre-implementation, but would be largely a formality, tbh. LRT is so far superior for that corridor, at this time. High floor would be safer. Riding 300 mm off the ground puts passengers perfectly in line with most car bumpers and these machines will not be immune from crashes caused by other traffic. But the bi level is not a bad compromise and with the wheel set arrangements they will be adequate for the fast Northern Expressway and the North Westerns open straight routes. Light rail is pretty sturdy compared to your average car. And you are sitting higher than in a normal car, let along the situation for a pedestrian or person on bike. Safety for light rail is much more about ensuring signals are clear and avoid layouts and phasing where people do dangerous cross-movements. In mature LRT-system cities, car-tram crashes exist of course, but they are a generally (and certainly in the public view) a total non-item in terms of safety discussion. A further safety benefit of high floor trains is that it will be much harder to walk across the tracks between platforms, without using the designated crossings. Sounds like that makes it more dangerous. If you make it hard to get across people will get stranded. 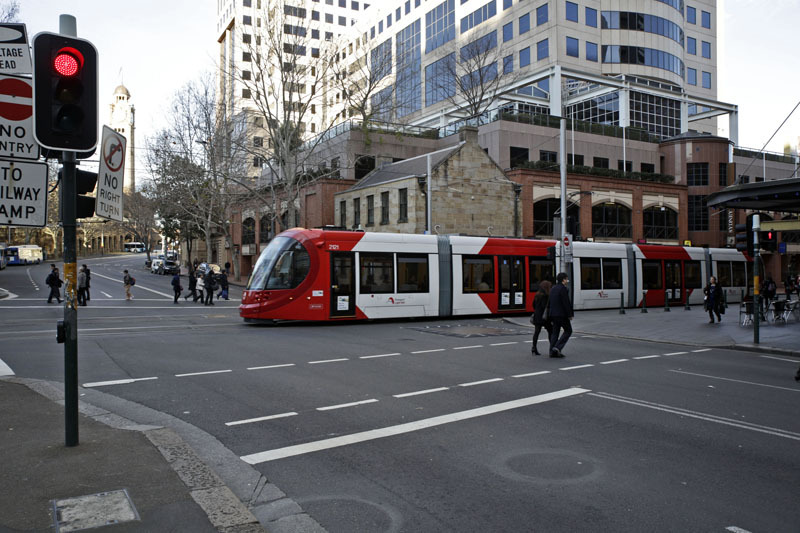 In Melbourne the cars are at risk from the trams, which weigh tens of tonnes. Are there tech specs for the various options? Turning circles, grade tolerance, etc? Devonport can have Light Rail when it actually accepts any growth. I suggested this idea in a previous post not too long ago, a tunnel or bridge from Judges Bay across over to Devonport and through Takapuna, and extend all the way up along the East coast bays up and further. Nobody on this blog likes this idea because of the lack of housing intensity on the peninsula. Still though, I feel it makes more sense to utilise the peninsula as a throughway for PT rather than the one-way-in/one-way-out that it currently is for private cars. Could have a stop on the flat along Lake Road in Ngatairanga Bay beside the sports fields (cheaper than an underground station), one in Belmont at the shops (serving a redeveloped Bayswater peninsula), one at Hauraki corner, Takapuna central obviously then either Hospital or Milford, and onwards from there depending on the route. One thing that is missing from most of the concept images, is any overhead wires. All of your real word photos include overhead wires. Is it required for light rail? Anyway to safely power from underneath? I’m not a fan of turning our streets into a mess of overhead wires if not necessary.. Put big hairy chested diesels in them then. No wires, just noise and smoke. However somehow I prefer the overhead and it does not have to look anywhere near as industrial as the train wires. Auckland Transports original announcement years ago said there would be no wired. There would be battery packs and wireless charging at all the stops and intersections. Michael I agree. If we do this please not over headwires on Queen etc. But what if third rail or induction could be used. Induction must be common now? Rotterdams new LRT units have option for both overhead and third rail built in. That removes necessity of overhead wires thru urban streets. Third rail certainly can’t as it will not be a closed-off network. Personally I think overhead wires can add to a vista when done well, such as those with stylised centre poles. The overhead wires for the Wellington trolley buses are not a good example though. Turns out the world has advanced a bit so my comment is wrong re third rail. Trolley wires are different story, without return current through the wheels they require two parallel and isolated circuits strung above, with insulators, circuit breakers etc all hanging above. There are plenty of systems on the market for ground level and internal storage wire free LRT systems. So far none has emerged as the leading contender to become the standard, each seems to have some particular issue with cost or reliability. The intermittently charged supercapacitor system seems to have a lot of promise. They are building a system in Taiwan that runs on that. Personally I’m not fussed by wires, look at the Sydney example above, they’re practically invisible. What speeds did the Smart study use to show that LR was faster to Aotea than HR? Was it 100kmh? If so then low floor units with a top speed of 70-80kmh could undermine this whole piece of work. Either way they need to do 100kmh if they are going to Kumeu or Orewa, the fact that our rail system is currently slow is not a good argument for making a slow LR system as well. They used both one estimate based on Hi-floor of 110km/h and one low-floor at 80km/h. Top speed isn’t as sigificant as you’d think once you factor in acelleration in and out of stops. It’s a difference of about two minutes to Orewa with 100km/h. Not entirely about speeds as well. I assume that ability to handle grades and turning capacity is also something that needs to be considered. Yes modern tram either use ground level power, or use super-capacitor charing at station. Don’t even consider those last century ugly overhead wires. When’s the sod turning for northwest rail, Mr Twyford? Took me more than an hour to CBD from Westgate this morning. They probably should do some designing and consenting first, make sure it is built properly and allowed to be built. If I may, I suggest you look at the solution that is used in the UK city of Manchester. This is a high floor system – as the trams (their local term) get outside the CBD they then run on the old heavy rail network. The raised platforms that they have installed in the city centre do not appear (if my memory is correct and not simply rose tinted) to be ungainly or particularly intrusive. The gold coast units seam to be having problems with residents complaining about noise. I slept in a room on the Gold Coast with an open, 1m2 window facing directly at the tram tracks. Even when I was awake, I barely noticed the trams going by. They are quite quiet running straight Sailor Boy. It is when they go around corners that they screech/squeel/grind/make that wobbling sound that is quite unpleasant. Agreed, they were louder on corners. In a much les extreme way than buses are louder uphill than on the flat. The fast straight runs will be in areas without residents (SH20, etc). The corners will be locations where people are living – Eden Terrace, Dominion Rd, Onehunga, Mangere, etc. Certainly a factor to consider. where are the corners on dominion rd? Either end. City end is maybe less of a concern as it straightens before it gets to the houses. But few houses at the bottom end. WRT your comment about Sandringham Road, there are two options; we put LRT on Sandringham, or we apply sensible zoning on Dominion. Clearly the latter is the better option. And remove the zoning from Sandringham and Stoddard? Why is Dominion Road better for LR? For example I’m wonder if the rise at Mt Albert Rd would allow a grade separation option. You get a closer connection to the HR at Kingsland. No, keep the THAB on Sandringham and fix it on Dominion Road. Dominion Road is better for LRT because it is so much shorter. I don’t disagree that Dominion Road should get THAB. However, there is alot of THAB zone along Sandringham and around Stoddard. In fact the first stage of intensification along Sandringham could happen as part of the route making and land assembly and then resale to developers. How much difference would it make to the travel times with the slightly longer route? About 2 minutes if you don’t have any extra stops, but you would likely have two extra stops, so would be over 3 minutes. Dominion Road currently has higher bus patronage and this will be the airport line, LRT should be on Dominion Road. The next LRT line could well be Sandringham Road. I think it’s more likely to be a commuter line. In fact that is the a better sell. If this LR line “terminates” in Puhinui (it should), then it maybe better for airport travellers wanting to go to the CBD to go via Puhinui. There is a big block of THAB around Hendon Ave. Which is over 1.5-2km away from Dominion Rd. It’s going to be a commuter line… for the southwest. The through route needs to go down Dominion Road. Samndringham definitely needs LRT, but it shouldn’t be first cab off of the rank. Ok. But under the current AUP OP there are no commuters along Dominion Rd. Destinations maybe, but not people starting their trips. So why for 2-4 min should Dominion Rd be first? Unless having the LR will then encourage a zoning change. “Ok. But under the current AUP OP there are no commuters along Dominion Rd.Destinations maybe, but not people starting their trips. There are more commuters along Dominion Road than Sandringham *right now*. In future there will be more along Sandringham unless we fix zoning. Therefore, we should build LRT on Dominion Road now and Sandringham road in the future. We should also change the zoning on Dominion Road, regardless of where the LRT goes. Are the coming from Dominion Rd? Or thru Dominion Road? If the later then via Sandringham Rd still provides a solution. Especially if an interchange can be built around Stoddard Rd. TIght corners are the noisiest. For noise sensitive sites you can encase the rail in a rubber boot that deadens sound and vibration. I assume these would need to be replaced occasionally, but it sounds like a good idea to keep open the number of LRT options. They work quite well but it is a capital cost issue. There have been examples down in the Dublin and Sydney tracks I am aware of for over ten years now. If our trams are going to suburb and considered ‘Rapid’, we definitely need high speed. 100kmh+ is required. A small amount of level is fine as soon as it is not too much. We can consider electric push-to-extend disability ramp. Meh, just get the trams that are actually just buses. The ones that can’t have a separated corridor down Dominion Road or fit into the CBD and have far higher operating costs? Great idea. Ahhh now I understand why Gold Coast ones top speed is pretty slow. I think the Bi-level may be best unfortunately because really like the idea of 100% low floor. Perhaps the steps inside are good in that longer distance passengers will tend to opt for making the effort to step up to them and find a seat rather than just standing or grabbing an easier seat nearby thereby giving a natural sort of seat reservation system. Sound aside, do Bi-level also give a better ride than 100% low floor? Possibly yes, although this also depends heavily on the generation of the vehicle and track design. Low floor LRVs on grass track can be very quiet. I wonder if the power lines are to be between the 2 sets of rails on one pole as in some of the other systems and if so is it thought that the rails would be in the centre of the carriageway as well. As a hobbly old joker I found the higher loading platforms of the Salt Lake city light rail a bit daunting at some stations. i like the idea of the lower loading system as in the centre of our Trains. I wonder if we have the platforms in the centre of the street whether the lower platform may be a better option as they would protect the passengers as well as giving a good delineation for the other traffic. You can use a single centre- pole. However because there needs to be safe clearance to the LRV on both sides of the pole, the track width gets wider, so the footprint of the system grows. There are low floor trams with bogies. Articulation is by jacobs bogies between sections. Type currently operates in Prague and Riga. If we intend on using them for long distance they need to be 100 km/h minimum. You can now get 100% low floored vehicles with higher speeds. It depends on the individual bogie and power specification of the LRV. A standard Alstom X05 with Ixage (pivoting) bogie will do 80 km/hr, similar to advanced models of Bombardier Flexity 2. An Alstom Citadis Spirit can do 100 km/hr and is 100% low floor. Bombardier tram trains in Saarbrucken will do 130 km/hr. The high speed vehicles generally cost more – Say 3M Euro for a standard 80 km/hr LRV versus 5M Euro for a high speed tram/train type. You need to consider other trade-offs too including capacity, access and passenger comfort. The 70% low floor vehicles lose a bit in capacity due to slower boarding and disembarking due to the internal ramps. For any vehicle that terminates in Queen Street the 100% low floor design will have many advantages. Pivoting bogies give a better ride. Hmmm yes so low floor quicker boarding on Queen St & Dominion Rd could make up for slower top speed in the other sections. Then comes in tripping on steps and injury when crashing at 100km/hr vrs 80km/hr say. Yes only capable of 70 km/h I’m sure the technology will pick up. Another quite important thing to consider is be very careful about the ETC system dwell time and and performance efficiency that we had for our heavy rail. We don’t want the door unable to open immediately when the tram arrives. We also don’t want fancy push a button to open door. Nor we want tram to operate unnecessarily slowly with overly safe clearance. It’s a shame that light rail is to be misused as a pretend heavy rail network replacement. Has Auckland learned nothing from past shortsightedness, such as the Harbour Bridge not having enough lanes? Why do we want standard gauge tracks beside narrow gauge tracks from Kumeu west? What happens when the standard gauge tracks reach Wellsford, as they will if you look at the 50 year vision? You end up with a more direct rail route from Auckland to Whangarei that can never actually be used as such because of incompatible gauge. Waimauku and Orewa are heavy rail territory. Having an inner heavy rail network and an outer light rail network will make Auckland the laughing stock of the transit world. Those poor kiwis, they got it all backward…. Had to laugh when u put it that way but we can always HR upgrade in 50 years where appropriate. I would hope that we sort out density issues within 50 years so that Wellsford wouldn’t be just a sprawled out extension of Auckland. If it were a satellite city of sorts then HR to say Orewa would be fine. Yes, I worry that we seem to be headed this way. Hopefully the optimal solutions will crystallize out and the hare-brained ideas will drop out once some serious design begins. Would it be possible to give projected times for the stops with the different units please? We may not agree on stops but I feel it would help thinking about these if we had an idea of its schedule. Having a long distance Whangarei service share tracks with a local all stops line sounds crazy to me. Why did we build a different kind of road to feed the harbour bridge, why not just run all the harbour bridge traffic down queen street? The LRV’s will run a standard LRT gauge (what was 4’8″ in old language) and will very likely be a low-floor type, but with special bogies which will allow for running up to 80km/h. Low floor types are much safer operationally as they require much lower platforms which reduces a number of safety risks. The hybrid bogies are a relatively new configuration offered by both Alstom and Bombardier and should be relatively commonplace by the time the LRV’s need to be ordered. It will almost certainly be a DC system as is standard internationally.